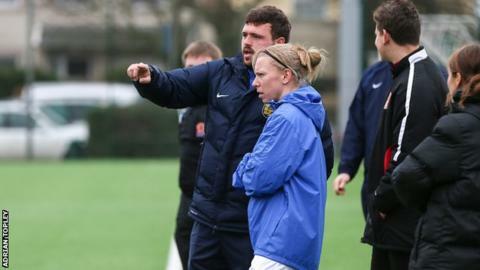 Jodie Botterill and Daniel Seviour have been appointed as joint-head coaches of the Jersey women's team. The pair have been in temporary charge since Simon Petulla and his staff quit in March after a disagreement with the Jersey Football Association. Jersey-born Botterill is a former Wales international, while Seviour is a JFA community coach. They guided Jersey's women, who were defending champions, to a bronze medal at this summer's Island Games. "I'm excited and honoured to be taking on the role as joint head coach with Daniel Seviour," said Botterill. "I have been a part of this team for over 15 years and I've always been extremely proud to wear the badge on my chest. "Our coaching team enjoyed the experience of the 2017 Island Games held in Gotland and are looking forward to working with the team." She added: "Daniel Seviour brings with him a lot of experience and knowledge of the game. His love of the game is infectious and he inspires players and coaches around him to do better." Jonathan le Fondre will be goalkeeping coach and former island player Fiona McKinnon will also join the backroom team. The first game for the new coaching team will be a friendly against Sheffield United Ladies at Springfield Stadium on Saturday 25 November.